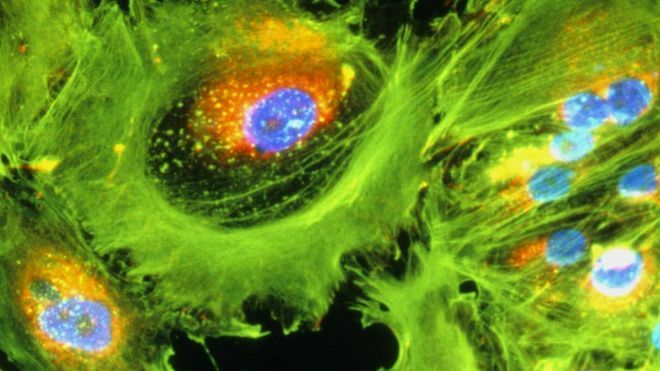 An immunotherapy drug has been described as a potential “game-changer” in promising results presented at the European Cancer Congress. In a study of head and neck cancer, more patients taking nivolumab survived for longer compared with those who were treated with chemotherapy. In another study, combining nivolumab with another drug shrank tumours in advanced kidney cancer patients. Immunotherapy works by harnessing the immune system to destroy cancer cells. Advanced head and neck cancer has very poor survival rates. In a trial of more than 350 patients, published in the New England Journal of Medicine, 36% treated with the immunotherapy drug nivolumab were alive after one year compared with 17% who received chemotherapy. Patients also experienced fewer side effects from immunotherapy. The benefits were more pronounced in patients whose tumours had tested positive for HPV (human papillomavirus). These patients survived an average of 9.1 months with nivolumab and 4.4 months with chemotherapy. Normally, this group of patients are expected to live less than six months. Early data from a study of 94 patients with advanced kidney cancer showed that the double hit of nivolumab and ipilimumab resulted in a significant reduction in the size of tumours in 40% of patients. Of these patients, one in 10 had no sign of cancer remaining. This compares with 5% of patients showing tumour reduction after standard therapy. About 12,000 people are diagnosed with kidney cancer in the UK each year and an average of 12 people die from the disease each day. “I feel a bit of a fraud having terminal cancer because I haven’t been in pain at all,” says Peter Waite, 64, from Hertfordshire. Peter started receiving combined immunotherapy (nivolumab and ipilimumab) in a clinical trial in early 2015 after doctors discovered he had a type of renal cancer several years after recovering from kidney and lung cancer. He was told he probably had three to five years left. 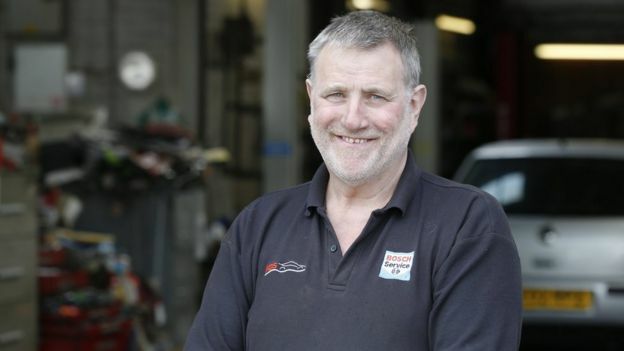 Instead of being treated with chemotherapy, he spent four months receiving both immunotherapy drugs and experienced virtually no side effects, allowing him to continue working as a motor technician throughout his treatment. Scans of his kidney and lungs show that one of his tumours has shrunk and two others have not shown any further growth. He is no longer taking the drugs and is being monitored every 12 weeks with scans. Mr Waite said his daughters have teased him about being a guinea pig – and considered buying him some hay. “I’m a very upbeat sort of bloke and I’ve been very lucky,” he says. As yet, nivolumab has only been approved for treating skin cancer and in June it became one of the fastest medicines ever approved for NHS use, in combination with ipilimumab, for the same cancer. Nivolumab and ipilimumab both work by interrupting the chemical signals that cancers use to convince the immune system they are healthy tissue. Prof Kevin Harrington of the Institute of Cancer Research and consultant at the Royal Marsden Hospital in London, who led the head and neck cancer trial, said nivolumab could be a real “game changer” for patients with advanced head and neck cancer. “This trial found that it can greatly extend life among a group of patients who have no existing treatment options, without worsening quality of life. Prof Paul Workman, chief executive of The Institute of Cancer Research, said nivolumab was one of a new wave of immunotherapies that were beginning to have an impact across cancer treatment. This entry was posted in immunotherapy, Kidney Cancer, Uncategorized and tagged GL-W, Greg Lance - Watkins, Greg_L-W, Head & Neck Cancer, immunotherapy, Ipilimumab, Kidney cancer, Nivolumab. Bookmark the permalink. ← When The Bones Join The Plot With Lung Cancer!